Will the Red Hat Acquisition give IBM more teeth in the Cloud Competition? At the price of $190 a share, the deal values Red Hat at a 63% premium over its closing price on Friday on the stock market. So, why is IBM paying this much for Red Hat? IBM believes that Red Hat can help its customers- many of which are running their infrastructure in the orthodox way- address the modern era of technology of the multi-cloud and hybrid computing driven by Linux and containers. IBM CEO Ginni Rometty said the Red Hat Deal is about preparing for “the second chapter of cloud” and that Red Hat would fuel growth across the company. Like for instance, IBM will move its software-as-a-service offerings to Red Hat’s stack when suitable. Strategically speaking, IBM’s Red Hat acquisition can play into all the company’s high-value efforts. IBM’s scale, as per Red Hat CEO Jim Whitehurst, will allow the company to grow faster and enable customers to benefit by breaking lock-in through open-source approach. This acquisition follows Microsoft’s $7.5 billion takeover of GitHub. While Microsoft bought GitHub to foster the open-source engagement on Azure, IBM has been struggling to keep up with Amazon, Google and Microsoft in the public cloud market. As per Forrester’s recent report, though, both IBM and Red Hat are performing quite well in the public cloud development-only platforms and enterprise container platforms arena. With the Red Hat purchase, IBM would have one of the top Kubernetes and container based cloud-native development platform. Furthermore, it would also have much broader open-source and developer tools portfolio than either company separately. This will effectively, give IBM the competitive edge in the cloud development platform market. While the merger looks great on the page, there are skeptics who think the acquisition is ripe with overlap and redundancy. With Moor Insights and Strategy writing “It’s not immediately obvious to me how the marriage between IBM and Red Hat brings combined value to the market. Both Red Hat and IBM both participate in the enterprise and private cloud market together, already. This will likely not impact IBM’s stature in the public cloud where the companies have a presence, but not nearly as much as the private cloud”. That said, Red Hat, more than anyone, can drive revenue out of open-source. By inoculating those fundamentals into the cloud, strategy and sales organization- IBM will gain a much needed boost. 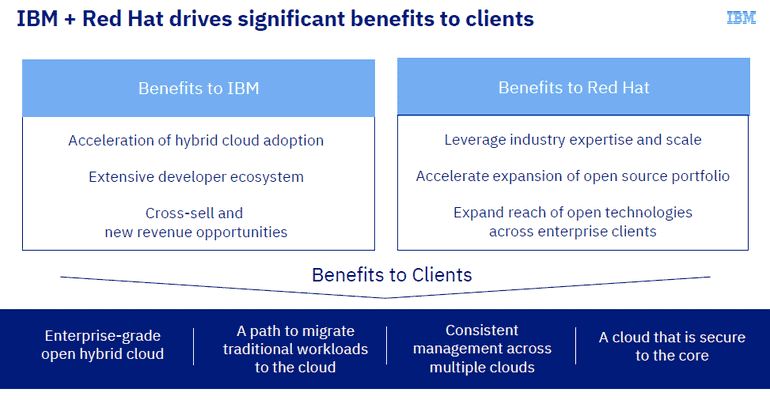 Of course, IBM is going for the public-cloud play, but their long-term interest is in the multi-cloud’ management. Will your company be sold on the concept of managing multiple clouds via open standards or would it prefer something patented? IBM is betting on Red Hat’s reliability to make a strong case for the company enough to allow it to manage cloud, AI and security. Only time will tell if companies will deem this cloud approach valuable or choose the simple one-vendor path. The IBM-Red Hat bet is that companies will get the comfort of one contract that they are used to and at the same time, be free to play with several vendors. For the most part, it is certainly a leap into the next stage of the public cloud competition consisting of Google, AWS and Microsoft. As for customers of both IBM and Red Hat, they’ll have to watch out for the likely closing of redundant services, like for e.g. IBM Kubernetes services. Nonetheless, the resulting summation of this deal should be definitely greater than its parts.